The need for more technology workers has been a hot topic since Charlotte lost its bid for Amazon’s second headquarters. The city’s pool of tech workers is at about 47,150, which is smaller than other markets, including the Raleigh area (60,900), according to the Charlotte Regional Partnership. Enter Charlotte-Mecklenburg Schools. The district is helping students to fill the void in technology and other areas by providing Career and Technical Education (CTE) training for high-demand, high-wage jobs. The district will hold the first Career and Technical Education Fair Feb. 24 to showcase CTE course offerings and to educate families about career opportunities. The free event will be held from 11 a.m. to 3 p.m. at the Charlotte Convention Center, 501 S. College St., and is open to the public. 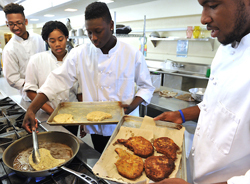 Families will be able to discuss CTE courses – from computer science to culinary arts – with school staff and to meet Charlotte-area employers. Interactive activities also will be featured. CMS wants to increase awareness of CTE, which begins in elementary school with science, technology, engineering and mathematics (STEM) activities. In middle school, students can take exploratory CTE courses, such as Medical Detectives or Automation and Robotics. High school students can choose a CTE pathway to prepare for a specific career. A pathway is similar to a college concentration or major and requires four of eight elective courses taken over a four-year period. Hall said students can’t lose when they choose a pathway. Some have Advanced Placement courses and the majority offer industry certifications and paid internships to prepare them for work or postsecondary education. The fair will have representatives from South Mecklenburg, Hough, Butler, Olympic, Rocky River and West Mecklenburg high schools; Hawthorne Academy of Health Sciences; and Sedgefield and Kennedy middle schools. Some of the participating organizations will be Learning Labs Inc., Charlotte Area Technology Collaborative, North Carolina HOSA: Future Health Professionals, North Carolina Technology Student Association, Charlotte Fire Department, Discovery Place Education Studio, Central Piedmont Community College, CMS School Choice, Goodwill Industries of the Southern Piedmont and Kennedy Middle Robotics and Drones.